Lavender Fields Emporium & Tea Room07580 139958work Tea/Coffee ShopLavender Fields Emporium & Tea Room is situated in the heart of Keighley on Cavendish St. This delightful little Tea Room supports local crafters and small businesses selling gifts and cards, which also includes a very popular vinyl record corner + Fair Trade gifts. Lavender Fields Tea Room is proud to be one of the Fair Trade eating places which contributed in Keighley becoming a Fair Trade town. The Tea Room serves snacks and light lunches, a firm favourite with the customers is our home made Quiche. All our cakes and bakes are all home made on the premises with scones being our speciality, there are many varieties to choose from with treacle being the favourite and all can be enjoyed as a cream tea. We have a wide selection of teas and coffees offering Fair Trade options, we stock over 15 loose teas with more being added these can be enjoyed in our charming collection of china cups and saucers. Lavender Fields aim is to be Keighley’s leading tea and coffee specialist. Lavender Fields opened in 2013 and was very honoured to be awarded “Tea Room of the Year 2013” by www.hashtagteaclub.co.uk. 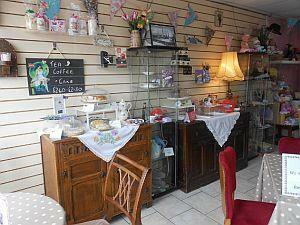 Lavender Fields Emporium & Tea Room is situated in the heart of Keighley on Cavendish St. Upon your visit you will find lots of interesting facts about Keighley and its bygone years on our history shelf for you to enjoy or reminisce with others.